The next episode in this ‘Analyse A Real PPC Campaigns‘ comes from analysing the giant themselves, Google, with their new take on a laptop. The Chromebook is both a competitor for Windows and Macintosh making it a very desirable piece of kit for most people who want to stay online (for example, I’m writing this article with a Chromebook!). For this reason, it is clear Google need to spread the brand awareness of this product to ensure maximum sales. 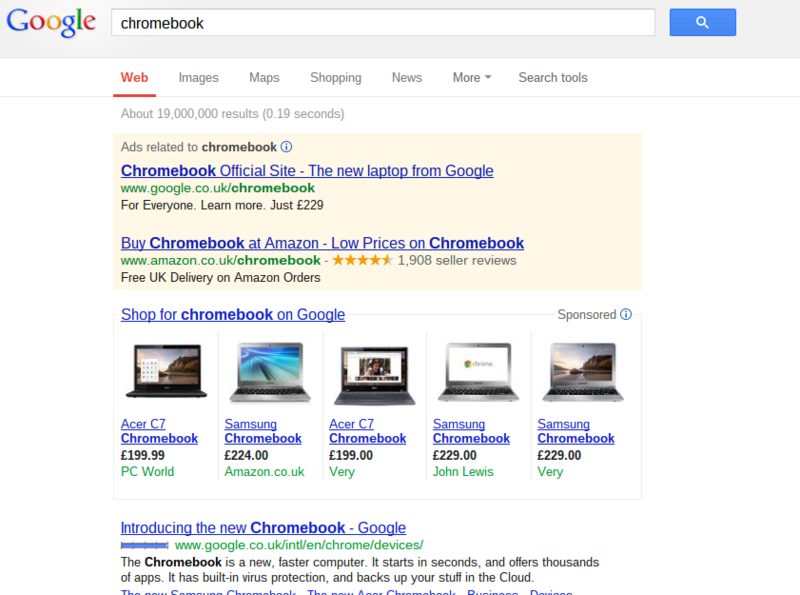 This is why Google have used their own program, Adwords, to create a PPC campaign to promote their new laptop range. 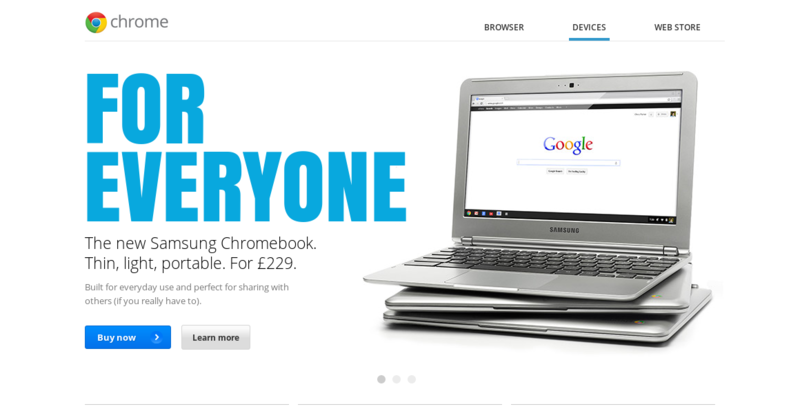 Chromebook Official Website – The new laptop from Google – Google has made the web user want to click on the advert already from using the word ‘new’. This makes clear that not many people will know about the Chromebook and since most people are curious about new things, they will want to find out more about this ‘new laptop’. Google have also made clear that they are the manufacturers. The brand image of Google is difficult to fault with it creating innovating products such as the extremely recently advertised Google Glass. Therefore, it is silly not to use Google’s brand image. For Everyone. Learn more. Just £229 – There are some PPC campaigns out there that can easily be criticised for having too long a description. The description is only meant to give a snippet of information because if it tells you everything you want to know: there is no point in clicking on the advert in search of more information on the advert’s content. Here, Google have used extremely short sentences to bring the point forward that this laptop is not targeted for anyone specific but everyone. They have made clear that if you click on this advert, you will ‘Learn more’ and they finish the description off with a price. This is a key benefit of the Chromebook that they are so cheap. Therefore, remember in your own PPC campaigns to bring out as the advantages of your product/service in your description like Google have. Text advert to be clicked. This has the bare minimum information about the Chromebook on it. Web user visits landing page. This is much more visual which is always more pleasing to look at than text. It is still pretty basic when it comes to the information of the laptop. ‘Learn more’ buttons enable the web user to control exactly how much information they want to read. From this, it might be a good idea to try this in your own campaigns. If you have a high bounce rate or exit rate for your landing page, make it more visual to look at with the introduction of ‘Learn more’ buttons.